The toll of diseases across the world could be reduced to a great extent by using safe water, hygienic latrines and by washing hands before handling food. Staying healthy is, therefore, easier for the rich than the poor. In poorer communities, the potential for staying healthy is greater if clean water is readily available and used properly. But proper use is feasible if water comes from a standpipe close to home. 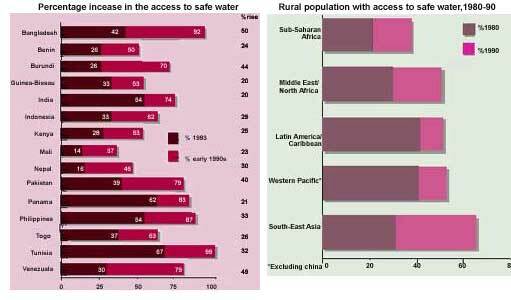 Here are some figures of purported rise in the availability of standpipe water, though this by itself means very little, because in developing countries, water quality is abysmally poor. And in the case of India, at least, even the water availability scenario is based on data grossly inflated by the government.